The US – China relationship is now second to none in importance for international economic relations and policy and accordingly is a major focus of IIEP. The centerpiece of this initiative is our annual Conference on China’s Economic Development and U.S.-China Economic Relations (or the G2 at GW), which has become one of the premier events of its type. For the last three conferences (2009, 2010, and 2011) we created a follow-up online “virtual conference volume”. Speakers at the first four conferences include Hongbin Li (Tsinghua University, Beijing), Shang-Jin Wei (Columbia Univ. ), Lu Ming (Fudan Univ., Shanghai), ZhongXiang Zhang (East-West Center), Peter Yu (Drake), Huang Yasheng (MIT), Li Xuan (FAO), C. Fred Bergsten (Peterson), Loren Brandt (Toronto), Kenneth Lieberthal (Brookings), Zhang Xiaobo (IFPRI), Feng Tian (Chinese Academy for Social Sciences), Meng Lingsheng (Tsinghua), Gao Fei (China Foreign Affairs University (CFAU)), Harry Harding (Virginia), Lixin Colin Xu (World Bank), Zhu Caihua (CFAU), Warwick McKibbin (Australian National Univ., and Eswar Prasad (Brookings). Next year’s G2 at GW conference will take place on 10-12-2012. 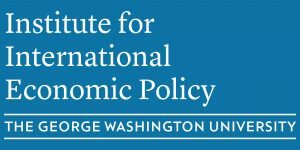 The research and policy analysis presented at the first five G2 at GW conferences together form the basis of a planned IIEP volume, to be edited by Professors Michael Moore and Stephen C. Smith.